This stenciled chandelier project is one I’ve been looking forward to. I found the stencil a while back and couldn’t resist buying it. It’s fun and funky…..and me. The finished look is over the top and I wish I had kept the wardrobe instead of selling it. Too late now. I found the wardrobe at a local thrift / flea market store. It was cheap! I decided on a color combination of black and green. You guys know how I love green. Sorry the photos aren’t better. I painted the wardrobe in the shop and the lighting is horrible. The green is bright and bold and beautiful. I painted the cabinet casing with Caromal Colors paint in Licorice. A deep rich black. The wardrobe cabinet had a glass door instead of a wood panel so I painted the inside of the cabinet green. There was a lot of surface to paint on this piece. Time to stencil the chandelier. Stenciling is super easy if you know the trick. You can find my stencil tutorial here….How to stencil. 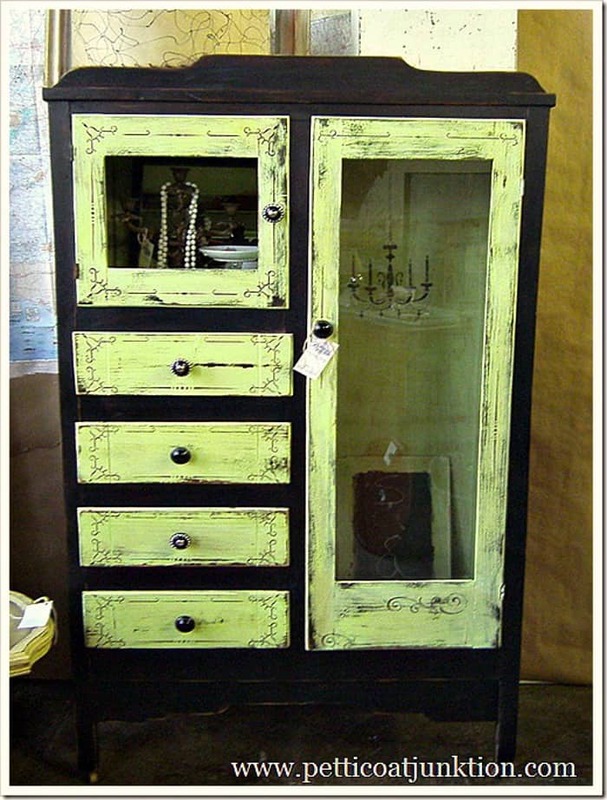 The small cabinet above the drawers didn’t have a mirror or wood panel so I painted the inside of it green also. It would be great for displaying jewelry or decorative items. I stenciled a soft design on the drawer fronts and cabinet door casings.Then I sanded the wardrobe inside and out using a palm sander and 60 grit sand paper for a heavily distressed look. And I added little bits of stencil designs here and there trying not to over do it. It’s easy to go from just right to tacky. This wardrobe can be used in basically any room of the house. I like to display folded quilts in the long glass front cabinet. It would also be great for linens, towels, coat, boots, etc. A special piece for any room! 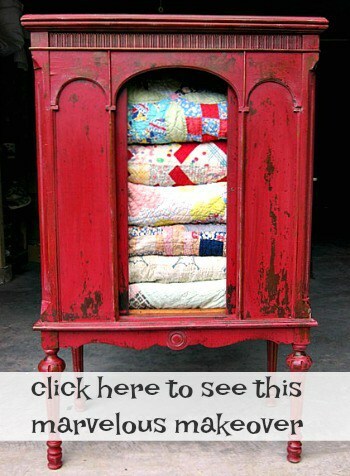 This post first appeared on Petticoat Junktion November 26, 2011. I updated it with new details and links to my detailed stencil tutorial. I was reminded of this wardrobe makeover when I say this room feature with green walls and lamps with black shades. Still one of my favorite color combinations. I don’t know if I should tell you guys this because it is still something I’m very nervous about. I’ve started doing Facebook Live tutorials. 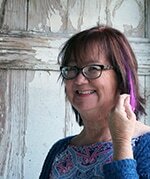 It is definitely a learning curve and I hate being in front of the camera. I will be doing more of them with just simple projects. You can see the one from yesterday by clicking here….Serving Stands. If you want to see more Facebook Live tutorials from me be sure and like and follow my Facebook page. 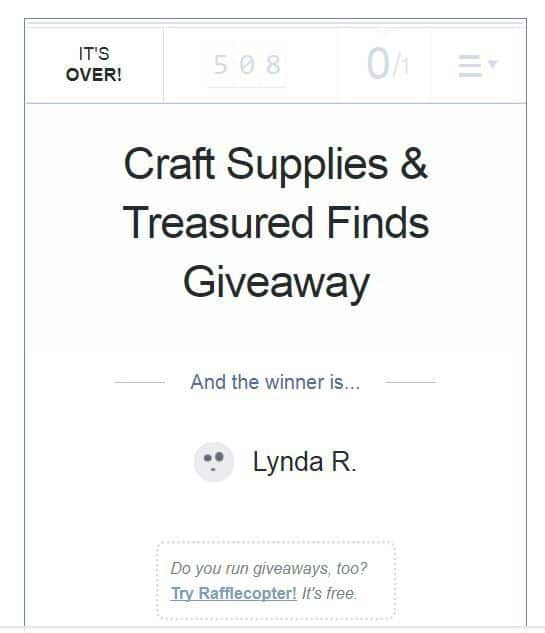 The winner of the October craft supply giveaway is Lynda R.
That is too cute! Yes, you should have kept that one! Kathy, you did SO MUCH work on this piece! Since you wanted to keep it but ended up selling it I think you should take the money you made on it and do something special for yourself with it. I think the stenciling gave it just the right look, but I have to be honest, here: I don’t like the yellowish green, but that is because that is one of my least favorite colors. Yellow and I have never been too friendly! I do think the idea of making the wardrobe two-toned was a really good one, however. And, as you found out, there was someone out there that loves that yellowish green, just like you! Love the color combination. I thought the chandelier was real. Great idea. Where can I get one of the chandelier stencils? I love EVERYTHING that you do. The stenciling reeaaally adds to this piece. GORGEOUS. I adore this more than words can say! great color combo! I looooove the stencil work on the drawers. this would be so great at my party, I hope you'll join. That. Is. Beautiful! Fabulous job! What an amazing furniture find. Thank you for sharing! Beautiful piece. You were featured today. Come by and grab a button. This is such a cool look, great job! thanks so much for linking up with VIF! I love the color and the stenciling. It turned out gorgeous. that is SO fun and the added details are to die for- that chandy inside is the best! Beautiful!I was totally fooled by the chandelier. I thought it was a reflection. Love the stenciling and distressed finishing. I wanted to stop by and say hello. What a cute wardrobe! Love the stencils and chandy inside. Love it. You did a great job on it. Stenciling really makes it special. Two tone was the way to go. It is GORGEOUS! I love the stenciling too, and the colors are just great together. Thanks for sharing.